Everyone is the default option. Content is accessible by everybody. Students and staff will be the only users allowed access to this content. If you want to be more specific in your selection, you can select sub-groups within a group. 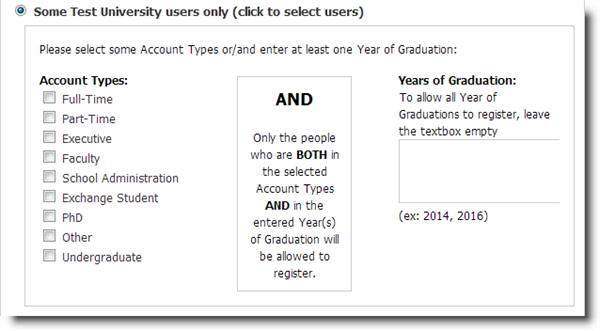 In order to do this, you need to select the Account Type. You have the option to select only group members. 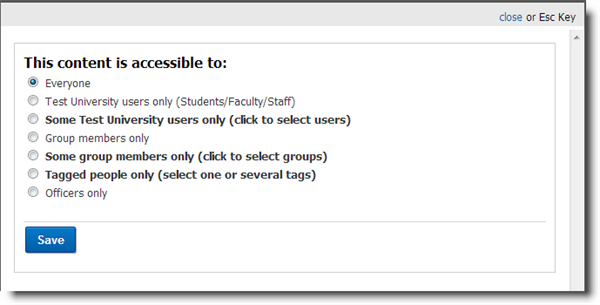 If you want to limit the selection of members within a group, you can select one or several sub-groups within the group just by clicking the checkbox of your choice. You can create groups using the tagging module. Select one or more tags to get a group of members with common features. You can select only members who are officers in the group.